The success of this Heroes Blog has exceeded our wildest expectations. Since we started blogging on heroes, we’ve had over a half-million visitors from all 50 states and 221 countries. The 20 nations who visit our blog most frequently are the U.S., Britain, Canada, France, Australia, the Philippines, India, Germany, Malaysia, Indonesia, Brazil, New Zealand, China, South Africa, Singapore, and Mexico. We thank all of you for visiting us, leaving comments on our blog posts, and giving us helpful feedback and suggestions. The top 10 U.S. states to visit us are, in order, California, Texas, New York, Virginia, Florida, Illinois, Pennsylvania, New Jersey, Georgia, and Ohio. You may have noticed that many of our hero profiles have been removed from our blog. This is because they are included in our 2013 book entitled Heroic Leadership. This book offers a new conceptual framework for understanding heroes, and it also integrates theories of leadership with theories of heroism. 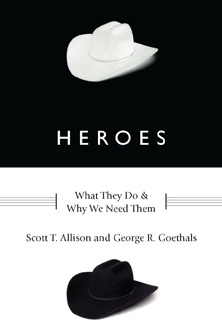 We’ve since authored many other books on heroism. Our Heroic Leadership book includes one-hundred hero profiles that at one time filled the pages of this heroes blog. It pained us to remove those hero profiles but fortunately we still have plenty of content with plenty more on the way. We’ve been studying heroes for many years and love blogging about them. So please do suggest some names for us to profile, or issues for us to address in commentary pieces. In the mean time, thanks so much for visiting us and for supporting today’s heroes.